한국에서 처음으로 기부문화 도서관을 탄생시킨 류무종 회장은 다야몬드치재(주) 대표로 1959년 서울대학교 중어중문학과를 졸업하셨습니다. 류무종 회장은 오랜 해외생활을 통해 선진국의 체계적인 모금문화를 접하면서 한국에도 전문적인 기금, 모금문화에 대한 정보를 제공할 필요성을 느꼈다고 합니다. 그 후 '아름다운 재단'과 인연을 맺어 나눔의 즐거움을 몸소 실천하고 있고, 또한 기부금으로 설립된 '류무종 기부문화 도서관'을 통해 한국의 모금문화와 모금에 대한 시민의식을 향상시키는 등 한국의 기부문화를 발전시키기 위해 꾸준히 노력하고 계십니다. 또한 도서관 사업·출판·교육사업을 통해 비영리단체, NGO, 국제기구의 실무자들을 모금전문가로 양성하고 연구자들에게 기금모금과 기부문화에 대한 정보와 지식을 제공하는 활동도 전개하고 계십니다. 류무종 회장은 기부문화에 대한 인식을 확신시키고 전문적인 모금에 대한 중요성을 널리 알리기 위해 서울대학교에 3억 원의 '도서관 발전기금'을 기부하셨습니다. 기부금 중 일부는 '류무종가족 기부문화 데이터베이스(YOU Family Philanthropy Database)' 구축을 위해 사용하고, 남은 기부금은 유지하면서 그 이자 소득으로 데이터베이스를 유지보수하는데 사용하는 Endowment 방식으로 운용하고 있습니다. 서울대학교 중앙도서관은 사회적 기부와 자선에 대한 전문적·학술적 정보를 총괄하는 '류무종가족 기부문화 데이터베이스(YOU Family Philanthropy Database)'를 위해서 기부문화와 모금에 관련된 전문서적과 학술자료에 대한 research Guide 등을 구축하고, 사회복지학과 조흥식 교수가 선정한 61종의 도서, 미국 인디애나대학교 기부연구센터 추천목록을 참고하여 양질의 도서를 구입하는 등 기부, 모금과 관련된 전문적인 정보를 종합해 기부문화 학술자료 컬렉션을 만들었습니다. 서울대학교는 사회복지, 봉사기관, 기부문화, 기금모금등과 관련한 전문지식 및 정보자원 정보를 수집한 DB를 제공함으로써 비영리단체의 모금활동, 사회저변의 기부와 관련된 인식제고, 학술연구기관 지원 등의 역할을 수행하고자 합니다. 이제 류무종 회장의 소중한 기부금으로 중앙도서관에서 수행중인 '류무종 가족 기부문화 데이터베이스(YOU Family Philanthropy Database)'의 구축은 도서관에 대한 직접적인 기부라는 점에서 중앙도서관의 위상을 높이고, 사회 저변의 기부문화를 일상화하는 아주 모범적인 모델을 제시함으로써 기부문화 확산에도 크게 기여할 것이라고 기대합니다. 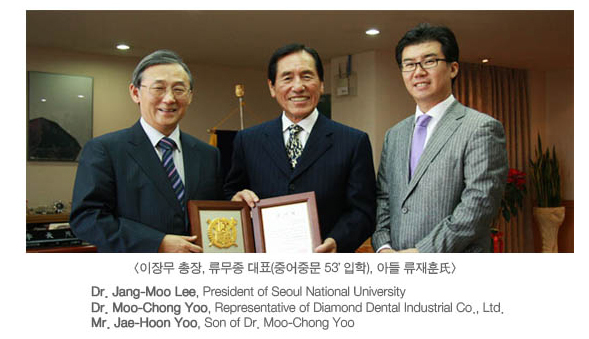 Mr. Moo-Chong YOU is a representative of Diamond Dental Industrial Co., Ltd. He graduated from Seoul National University’s Department of chinese Language and Literature in 1959. In 2000, he established the first library of philanthropic resources in Korea. Mr. YOU said he found it necessary to create the philanthropy library because he had experienced a well-organized culture of giving in other countries during his time overseas and he wanted to cultivate a similar culture in Korea. Mr. YOU formed a connection with ‘The beautiful Foundation’ and has since been personally experiencing the joy of giving. He established the ‘YooMooChong Library for Philanthropy’ with donations in order to increase the understanding of giving and fundraising in Korea. Mr. YOU manages the library and participates in its publication and education functions. He is also active in training employees of non-profit institutions, NGOs and international organizations to be professional fund-raiser. These efforts also contribute to the production of information and knowledge on fundraising and philanthropy. This database, as developed by Seoul National University Library with donations from Mr. YOU , will raise the status of the library as it is a direct donation to the library and it will also serve as a role model for developing general culture of giving in Korea.